The Tibor de Nagy Gallery is pleased to present an exhibition of six artists, three sculptors and three painters. With the notable exception of ceramic sculptor George Ohr (1857-1918), the remaining five are contemporary artists and are represented by a selection of new work. Irrespective of their medium---whether a painter or sculptor----each of the artist’s pieces is modestly sized, and shares an intimacy and a painterly approach to abstraction. Their work shares sensibilities consisting, among many other things, of autonomy, movement, and playful use of color. The artists have each arrived at their own vocabulary and their work taken individually inhabits distinct and intimate worlds. 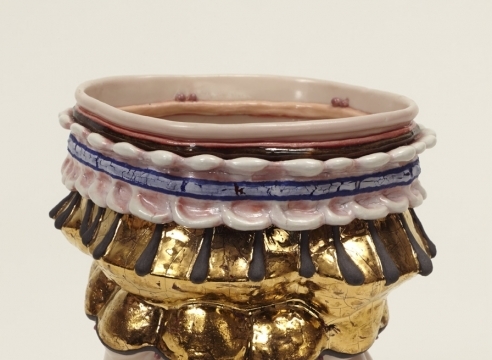 Kathy Butterly uses seemingly-dissimilar materials and patterns, seamlessly intertwining them into vessels that seem to spiral around themselves. Though her process is labor-intensive, the end result feels improvised, fresh, and light. The fluidly curving forms of John Newman’s sculptures, with their small scale and gem-like quality, evoke little worlds of intimacy. Quiet and delicate, the works seem not to have a beginning or end; they emerge into space while seeming to draw into themselves. When one considers the time period in which George Ohr was working (he was born in 1857 and died in 1918), the sheer modernity of his ceramics becomes all the more astounding. His works convey spontaneity and confidence in his technique; his inventiveness exudes intelligence and an improvisational flair. Though working in oil paint, Leslie Wayne’s method of pinching, folding, pulling, and slicing her material cannot help but be seen as sculptural. Each twist and fold is energetic and surprising, revealing layers of exuberant color that reveal a pliable sensuality. Andrew Masullo’s paintings express an interest in shape, though a resistance against allowing shape to dominate color, movement, or surface. This push/pull serves to create a joyful and dynamic confidence in the manipulation of material. Thomas Nozkowski’s abstract oil paintings explore the realm in between the geometric and the organic, employing a seemingly limitless vocabulary of shapes within the confines of his small works. His use of subtle variation continually questions the figure/ground relationship, making his paintings seem at once two-dimensional and sculptural. The gallery will present an exhibition of Butterly’s recent work at the ADAA Art Show, March 2– 6, Booth D-28.